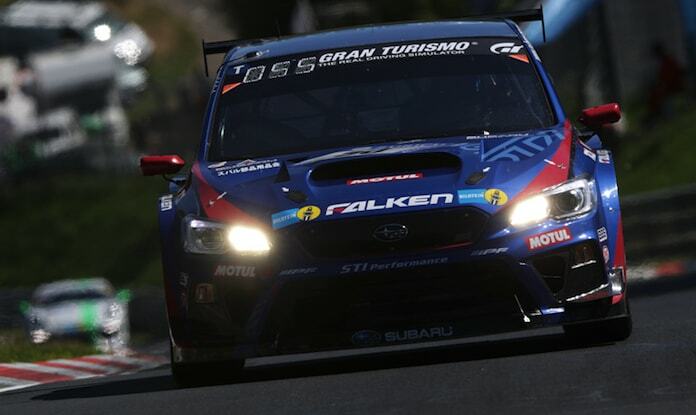 Subaru will be involved in motorsports around the globe again in 2018, from the NBR and Super GT to the GRC. Here’s a sneak peek. Look for the 2018 Subaru WRX STI and BRZ sports coupe to bring more motorsports excitement in 2018. Subaru and Subaru Tecnica International (Subaru’s motorsports partner) will be involved in three major global motorsports activities again in 2018, from the 24-hour Nurburgring race, Super GT to the Red Bull Global Rally Cross series. Subaru of America will also bring two WRX STI rally cars to the American Rally Association Championship again in 2018. It should be another action-packed season in 2018 as Subaru competes in four motorsports activities with the WRX STI and BRZ. It’s what the brand is about and there will be plenty for Subaru fans to cheer on. The motorsports season kicks off with the Super GT series in Japan. The Super GT series starts April 7-8 at Okayama International Circuit in Japan. The 2018 series consists of eight races, seven of which will be held domestically in Japan, and one single fly-away round in Thailand. 2018 will be a landmark season for Super GT, it will be the 25th full season of the series that began in 1994 as the All Japan Grand Touring Car Championship (JGTC), with its current dual-class structure consisting of what has now evolved into GT500 and GT300. Subaru had a rough season in 2017 finishing as high as second place once in the third round, and finished the season with a disappointing retirement without finishing the race. Taku Iguchi and Hideki Yamanouchi will return as drivers of the 2018 Subaru BRZ GT300 race car. The American Rally Association 2018 Championship series starts in Oregon at the Oregon Trail Rally April 20-22, 2018. All five U.S.-based events run in 2017 will be returning to the calendar for its second season in 2018. In addition, ARA announced the Idaho Rally will become a national event and added to the calendar for 2018. A seventh event will be announced in the coming months. It was a close battle all season with Subaru Rally Team USA teammates David Higgins and Travis Pastrana trading 1st and 2nd place finishes throughout the 2017 Championship run, resulting in a thin margin between the two in the ARA Driver’s Championship points leading into the final round. In the end, it was Travis Pastrana and Robbie Durant in the #199 Subaru WRX STI narrowly beating SRTUSA #75 piloted by David Higgins and co-driver Craig Drew for the 2017 American Rally Association Championship Title. They will do battle again in 2018. The legendary Nurburgring 24-hour race will take place from May 10-13, 2018 and Subaru will be there to attempt three wins in four years. Last year, with only three hours to go, the 2017 Subaru WRX STI NBR suddenly caught on fire and was forced out of the race. Subaru had won the past two years in-a-row, but there would be no three-peat in 2017. The Nordschleife is considered one of the toughest race tracks in the world. It’s a narrow serpentine with a hard coating, closed corners and sharp elevation changes, without lighting and with minimal security measures. In many places, cars literally come off the ground. There’s more than 170 turns of varying difficulty and a huge number of blind ridges and narrow corridors, protected only by fencing. There’s very little room for error. For 2018, drivers Carlo van Dam (Netherlands), Marcel Lasee (Germany), Tim Schrick (Germany) and Hideki Yamauchi (Japan) will be back with the 2018 Subaru WRX STI NBR. Round 1 of Red Bull Global Rallycross starts in Louisville, Kentucky May 19-20, 2018. Red Bull Global Rallycross for 2018 will feature 12 rounds, eight events, and the series’ long-awaited return to Europe for rounds 11-12. Subaru is making progress and seems to be catching the competition as Patrik Sandell and Chris Atkinson reached the podium a handful of times in the #18 Subaru WRX STI and #55 STI in 2017. Atkinson and Sandell return as drivers as SRTUSA has been busy this off season trying to improve the 2018 WRX STI GRC Supercars even more so they can catch Scott Speed and Tanner Foust in the VW Beetles in 2018.